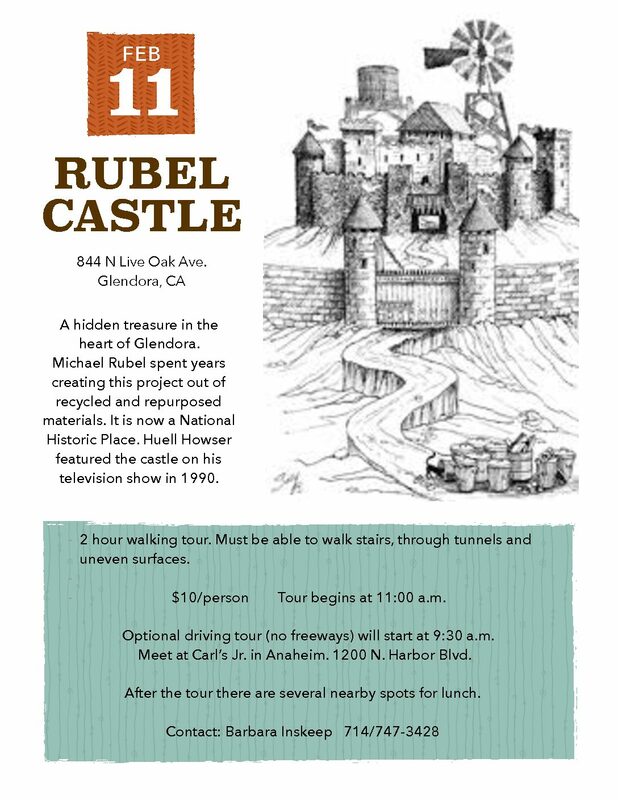 Barbara Inskeep of the VMG Club has planned a tour of Rebel Castle in Glendora for Saturday, Feb. 25. We have never done this event before so it’s something completely different! 844 NH. Live Oak Ave.
2-hour walking tour. Must be able to walk stairs, through tunnels and uneven surfaces. $10/person Tour begins at 10:00 a.m.
· Optional driving tour (no freeways) will start at 9:30 a.m. – Meet at Carl’s Jr. in Anaheim. 1200 N. Harbor Blvd. · For those not in O.C. or SFV, let me know if you want me to put out a meeting/caravanning plan for your area. After the tour, there are several nearby spots for lunch. EVENT HAS BEEN RESCHEDULED TO THE 25TH. THE FLYER BELOW SAYS 11TH BUT IT IS FEB 25TH. RubelFlyer2 click here to download.